The South African city has topped Global Water Intelligence's annual listing of the largest water tariff increases in 2018 with a 390% increase in the benchmark price of water and wastewater services. Overall the global average price of water and wastewater rose by 3.8% to $2.04, held down by price cuts in Northern Europe and cities in Africa and the Middle East choosing not to increase rates. October 10, 2018 (www.waternewswire.com) The results were released in a new white paper entitled The Global Value of Water, published by GWI in partnership with Arup and The Global Water Leaders Group (GWLG), and featuring analysis and commentaries on The Global Water Tariff Survey 2018. The 2018 survey is the most extensive yet carried out by GWI, calculating changes to the price of urban water and wastewater in 512 cities across 191 countries, based on a benchmark of an urban household of four using 15 m3/month. The white paper documents how Cape Town's tariff hike aimed to penalise households using more than 6m3/month as water levels in the dams serving the city fell below 35%. This measure helped cut peak water usage in the city by 54% and Day Zero – the day the city ran out of water – never came. With dams refilling, tariffs are now adjusted downwards. Christopher Gasson, Publisher of Global Water Intelligence, commented: "The global average price of water needs to at least double if everyone is going to get reliably potable water in the long term. These increases matter because they attract much needed investment into the sector and they encourage better use of resources." "We are also seeing utilities becoming more active in offering social tariffs to reduce the impact on low income households. Delhi for example, has been able to increase its overall revenues by introducing a jump tariff structure. Low volume users get water for free, but anyone using more than the basic threshold gets charged a full price for all of their water use." 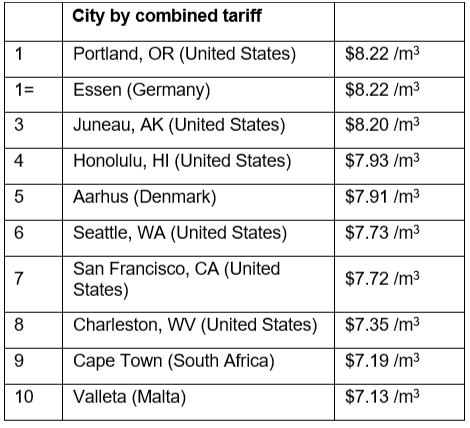 "Most tariffs are volumetric, but we are seeing a trend towards higher fixed elements of water and wastewater bills. It reflects the fact that for most utilities 80% of the costs are fixed, and in older cities with falling water demand, there are few alternatives." Journalists with valid press credentials wishing to access the full dataset should request press access from Alex Shuttleworth on ashuttleworth@globalwaterintel.com. 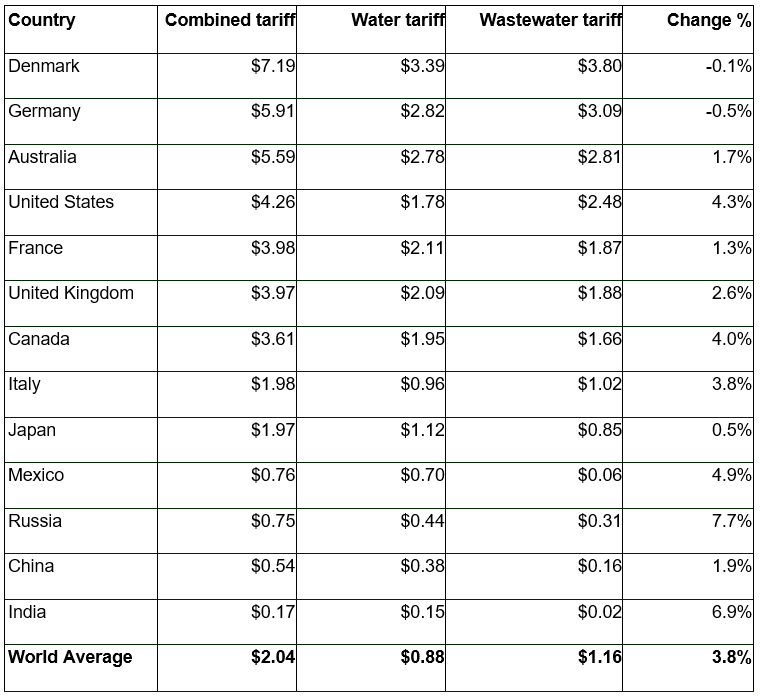 The Global Water Tariff Survey is the leading repository of global water tariff data and analysis, featuring urban water & wastewater tariff profiles from 512 locations. It is updated annually by Global Water Intelligence (GWI). It calculates changes to the price of urban water and wastewater in 512 cities, based on a benchmark of an urban household of four using 15 m3/month. 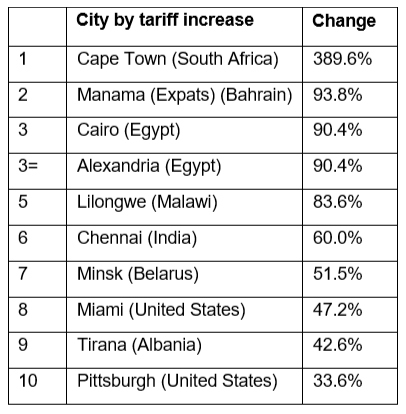 Tariff percentage changes were calculated based on price changes between July 2017 and July 2018. Global Water Intelligence (GWI) researches and publishes business data and information about the water markets worldwide. Based in Oxford, UK it also has offices in Singapore and USA (Austin, Texas) and has researchers and office staff in many other countries. It publishes three subscription titles and a free weekly GWI Briefing email (http://www.globalwaterintel.com/accounts/mailinglist/) and around four individual reports per year on particular water sectors/geographic regions. It also organises two major financial conferences for the water industry each year: the American Water Summit in Autumn and the Global Water Summit in Spring. GWI was awarded the Queen's Award for Enterprise in 2011.